HI, (first post, new Acorn user). 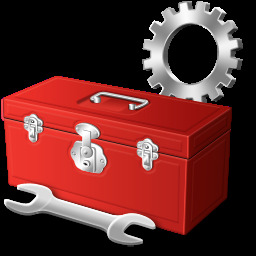 I am trying to use Acorn 5.6.6 (I’m on Yosemite 10.10.5) to edit some icons I am working on (for my own personal use). The icon art in my first test is a 256 square PNG image. I enlarge the picture to 1200, good to see that after 800% it shows pixel lines. But less good is that the image is all fuzzy bits. 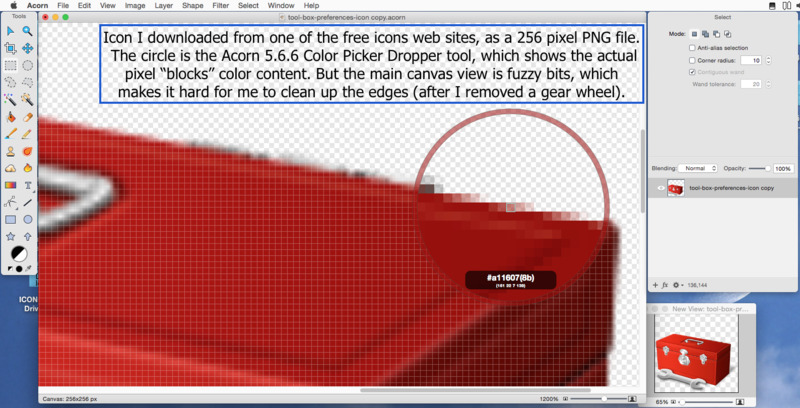 The only time I can see what is really at the pixel level (what color each pixel actually is), is when I hold the Color Picker dropper over a section of the image. Then in the circle it really shows exactly what each pixel has in it. My Question: Is there a way to make the viewing canvas workspace display the image in that intentional bitmapped blocks? As if the whole thing was in a much larger color-picker viewing circle? I had searched the forum for Pixel topics and while I found a few on icon and icns, the only one that seemed to focus on pixel working said to Layer / Rasterize. But that either does nothing to my image, or else it is just grayed-out. I was hoping to find a “View Mode Pixels Not Fuzzy-Edges” … or something like that. There shouldn’t be any fuzzy pixels when zooming in (also known as interpolation). Can you give me a screenshot of what you’re seeing when zoomed in at 1200%? HI, Thanks for the fast response. Here is a screen-shot with the enlarged fuzzy-edged icon (256x256 pixels png file), and a smaller “new” view of it, and the Color Picker dropper pickup enlarged circle. The pickup circle shows the actual ‘square’ pixel content as I believe it really is. While the main Acorn canvas window shows everything with hypothetically anti-aliased fuzzy edges everywhere. Makes it hard for me to clean up the back edge, where I used the selection and delete process to remove a large gear wheel. I can attach the source PNG file as well (I think I can… or maybe not, it seems I can’t upload a second attachment, or even the first. maybe too large. I’ll try again.). Maybe I have to post it to an image hosting forum and then paste a link to it into this forum. Here is a link to the screen shot. (Mac was bought from Apple, only additions were more RAM later). (Upgraded from original Snow Leopard to 10.8, then fresh install of Yosemite a while back). It was my understanding from the Acorn website that v5.6.6 was the last version that would run on Yosemite 10.10, and that v6 requires minimum of El Capitan (10.11) or later. I have an even older iMac that I am not using, also with Yosemite 10.10.5, I will try to boot it up and put Acorn 5.6.6 on it and see how it appears when I try to edit that same file. I’ll also try setting up a new User ID on my iMac 2010 to rule out any user-specific issues. I’ll post back with my results. I’d be really curious to know if another account or install has the same problem. I’ve not had any reports of this problem from anyone else (that I can remember anyway. I’m sure I would).